The accounting industry is under substantial change. There are pressures to evolve from being predominantly a provider of tax compliance services, to becoming an active provider of daily value for your business clients. The entire industry is in a state of flux, and many additional services are being considered including management accounting, reporting, bookkeeping, software supply, and business advice. Some firms are bundling many services, some are taking more of an 'a la carte' approach, but what is clear is that it's a wise time to be looking at what else you can be adding to your revenue sources. Offshoring presents amazing opportunities and significant threats for accounting firms and internal accounting departments. The threats mainly stem from doing nothing, and being unaware of what your competition is doing. Yes there are data security, privacy and Australian staff satisfaction considerations, but these can be addressed, and these issues are NOT holding firms back from already conducting work offshore. The opportunities are many, including for example bookkeeping. For decades this has been the bane of accounting firm since it became a negative margin product, but with almost always the requirement to do some of it for clients anyway. The messier the client data, the more work you have to do, the worse your profit on the account, and often the unhappier the client. Many firms are reversing their strategy and embracing bookkeeping. When done offshore, its a high margin product, often a new revenue stream, and is also a way to win new clients, by saving them money on a monthly purchase they need to make. It embeds you and your other services further into their business, and frees up your staff for more complex work and value-adds. As well as that, it's possible to do most accounting functions offshore, depending upon your appetite for changing your business processes to observe strict quality control. Your offshore team can create management accounting and other reports, they can liaise direct with clients (if you want), they can prepare compliance documentation, they can chase up client documentation, they can chase your debtors, they can manage your Australian payroll, and they can provide a lot of administrative functions. There is NO one-size-fits-all approach to this. Different firms needs different solutions, depending upon what they want to achieve, what is their immediate and future scope, how big their Australian team is, and what management and training capabilities they have inhouse. But there is a strategy that suits every firm. Some choose to "outsource" to a third party who brings all the processes with them. Some choose to set up a semi-independent team and recruit their own staff and manage their own processes, but use a third party for office space, payroll HR/IR. Some choose to be completely independent and lease their own office and incorporate. Some choose to do a mix of these approaches. But where do you start? How do you have confidence that you are choosing the right strategy? That's what Easy Offshore does - it educates businesses on how to succeed offshore. We do NOT provide staff directly to you. We give you all the information and tools you need in order to choose what strategy, providers, and locations are right for you, and then implement. When establishing an offshore team, or outsourcing, there are a lot of things you could do wrong that mean you end up with a bad result. Picking a good provider is only one piece of the puzzle, so don’t expect a good result if you just do some travel or attend a tour which does not focus on your specific strategy. It's easy to make a decision based on a glossy brochure or a sales pitch. What you really need to know are which providers have been tested to perform well, and which ones will put in the effort to help you succeed. Following a friend who is happy with their provider is also not the greatest idea, unless their business is identical to yours. There IS a perfect solution for your business, and you’ll easily find it if you are methodical. Easy Offshore has 100% success rate at offshore implementations, due to our comprehensive process. This is efficient, low cost, and addresses ALL the common reasons for poor results offshore. 1. Educate on the concepts, strategy, and reasons for failure. We give accounting firms the tools and knowledge they need to succeed.Topics include staffing models, tested providers, culture & management, recruitment methods, salary packaging, technology needed, implementation strategy. This is all delivered within our half day Master Class. (There's a big pile of hand-out documentation that you need to review and follow at each stage of implementation). 2. A discussion around your goals with offshoring will reveal the outline of the strategy. Phase 1 scope, phase 2 scope, tasks/roles in each phase, provider requirements, implementation and management gaps. Clients of Proactive Accountants Network get a one hour strategy session and report for free. At this stage you now know enough to select your staffing model, select any providers, and get started. 3. Optional: Book a tour. Many clients choose to increase their confidence in offshoring by going on an Easy Offshore guided tour. This is designed to take the offshoring theory and the strategy outline and match it to potential providers of services/facilities. Visit providers which help show you what is possible for your business, and help to clarify your exact strategy. We aim to give you all the information you will need to succeed without needing to pay us for consulting. However, if your offshoring scope is greater than ten positions, and especially if you want rapid roll-out you may want a consultant to help you with each step of the implementation. 5. Optional: Find an Australian to run the team offshore. This is recommended for teams of 10 or more, and we can help you find someone qualified to move over there and run your team. Draw this person from your own team though if you can. Contact us today, or book into a workshop near you. 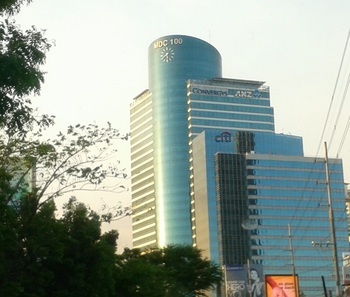 PHOTO: MANILA IS A SURPRISINGLY MODERN CITY WITH ITS SEVERAL OFFSHORING HUBS.